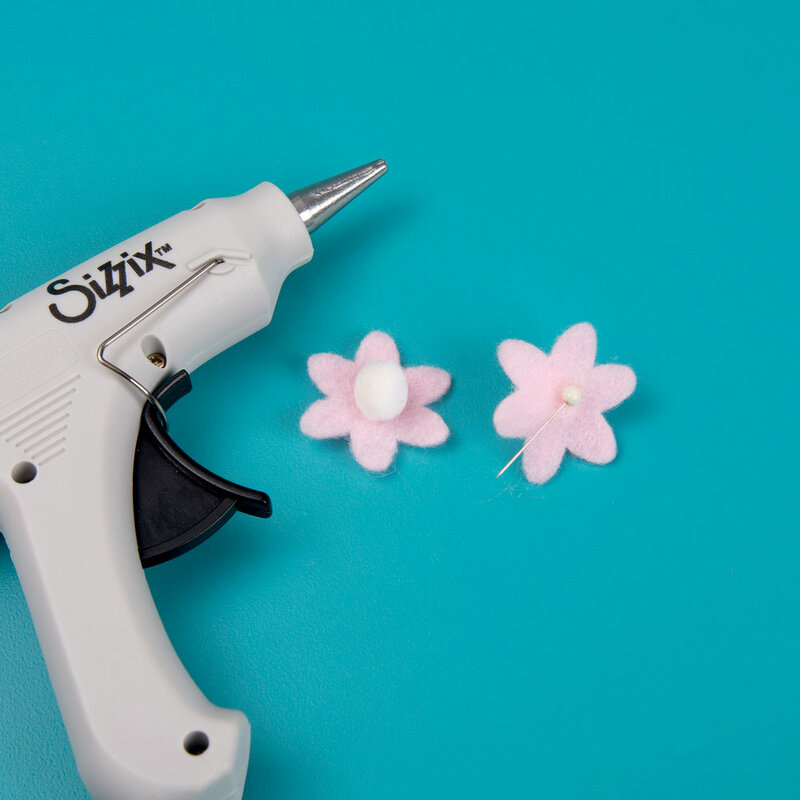 Note: The Sizzix Hot Glue Gun is only compatible with power requirements that are the same as those found in the United States and Canada. Consumers who purchase this device and use a different power source in any other part of the world will void the manufacturer's warranty. 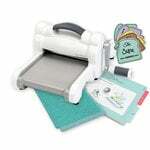 Sizzix Hot Glue Gun Stand measures 6" x 1" x 13"
Heat-resistant craft mat measures 6" x 8.75"
You and this bundle are going to be glued at the hip! We have everything you could need in a glue gun toolset and more with the Sizzix Glue Gun and Heat Resistant Accessories Bundle! Check everything off your glue gun wishlist with all of these amazing and helpful tools bundled for you in one fantastic pack! An amazing and powerful, ergonomically-designed glue gun? Check! A handy-dandy stand to set your glue gun on while you are being an artistic genius? Check! A heat-resistant craft mat with multiple silicone tools? Check! A whole bunch of backup glue sticks? Check! Power: 8W Voltage; AC: 120v; Frequency: 60Hz - with a polarized U.S. standard plug. 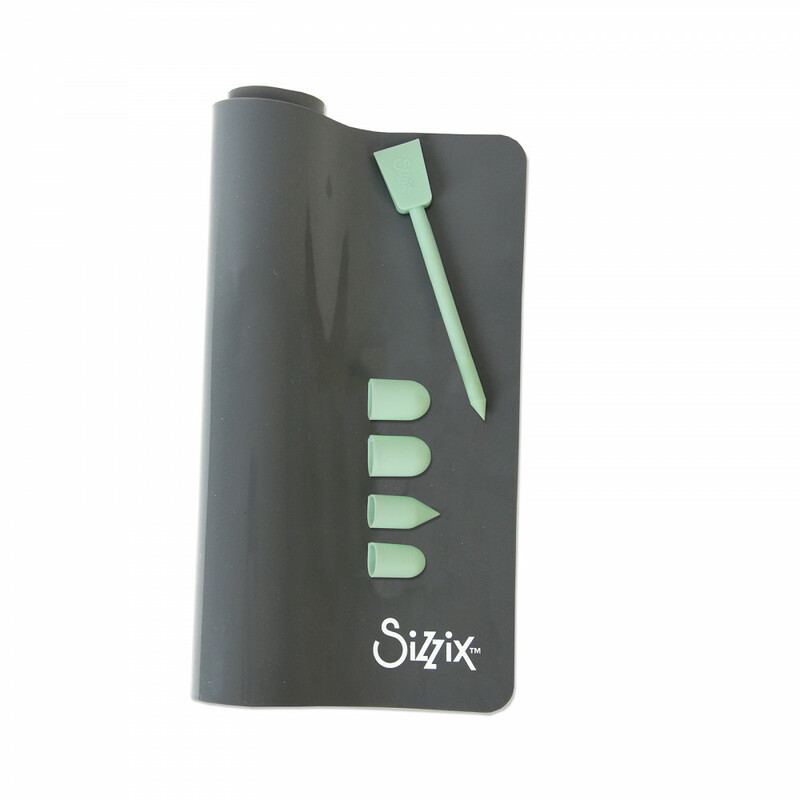 Collapsible glue gun stand folds down flat for on-the-go portability and easy storage. A handy toolset of silicone finger caps in various shapes and sizes, plus a dual-ended spatula/stylus tool to ensure fingers stay glue-free! A heat-resistant craft mat and removable stand drip tray built to withstand hot glue and wipe clean. Set out the craft mat and glue gun stand in your desired workspace and open up the stand to your desired angle (three choices to choose from!). 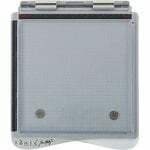 Ensure the heat-resistant glue catching tray is inserted into the front of the glue gun stand. 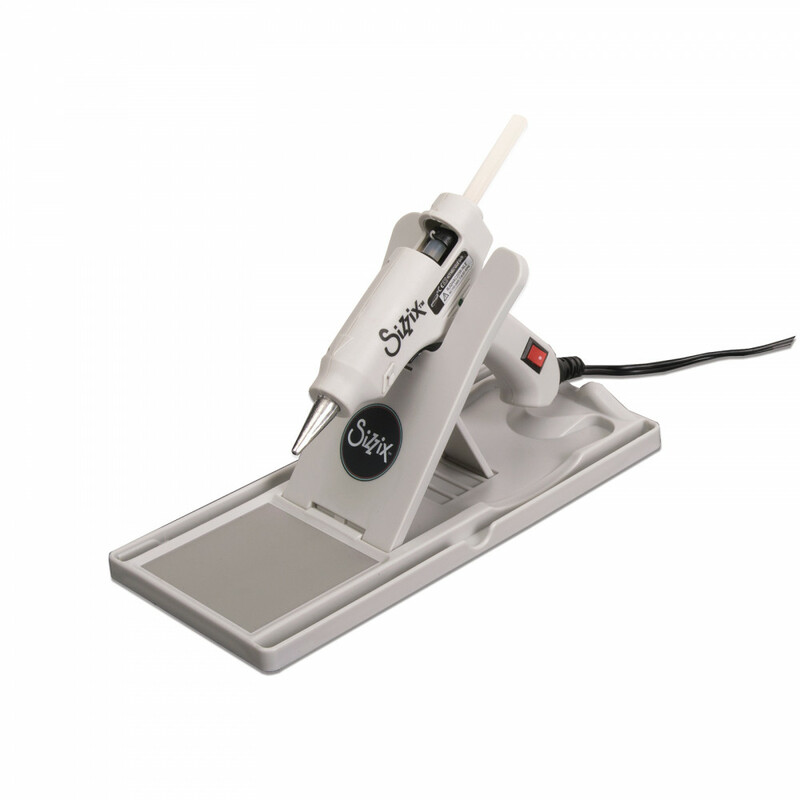 Plug your Sizzix Glue Gun into a compatible, polarized electrical outlet and prop it carefully within the stand. Insert a 7mm glue stick (included) into the inlet tube of the glue gun. Allow roughly five minutes for the glue gun to heat up the glue. Aim the nozzle of the glue gun to your project or surface that needs gluing. Give the glue gun trigger a gentle squeeze to start dispensing the glue. The more pressure you apply, the more glue will be dispensed. 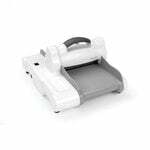 Press surfaces to be glued together within 15 seconds of dispensing the glue to ensure maximum effectiveness and hold. Don't be afraid to press down on the glue with the silicone finger caps, since they are heat-resistant and made to withstand the glue. Use the stylus for gluing tiny embellishments and the spatula for spreading the glue in a thin layer to cover your project. If you get glue on the heat-resistant mat or removable stand tray, it can easily be wiped off before your next crafting adventure! 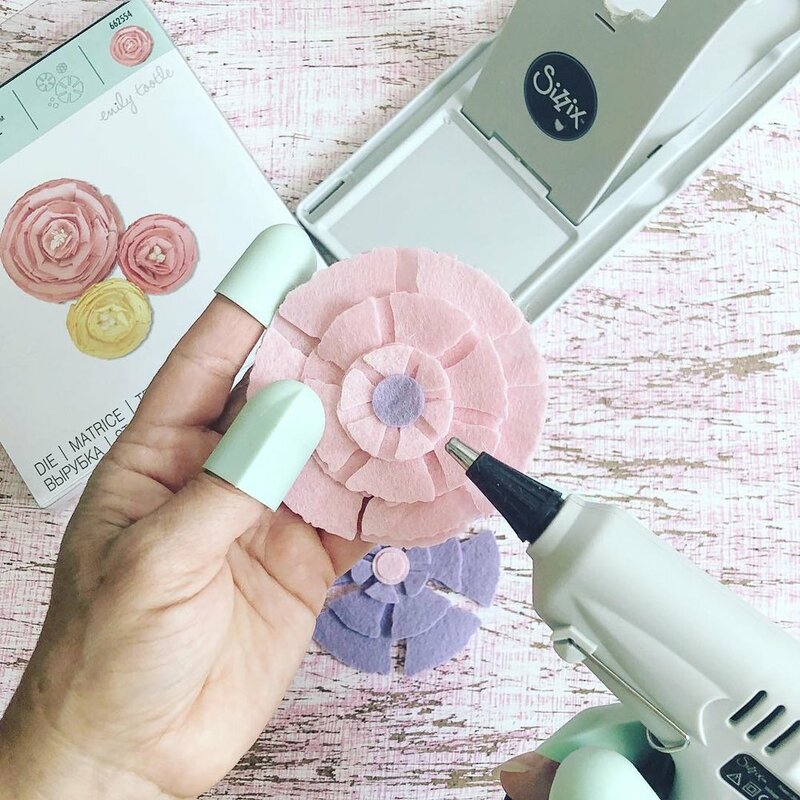 Gone are the days of excess glue accidentally dripping onto your masterpieces while you try to juggle a hot glue gun in one hand and various embellishments in the other with a piece of paper dangling from your mouth! 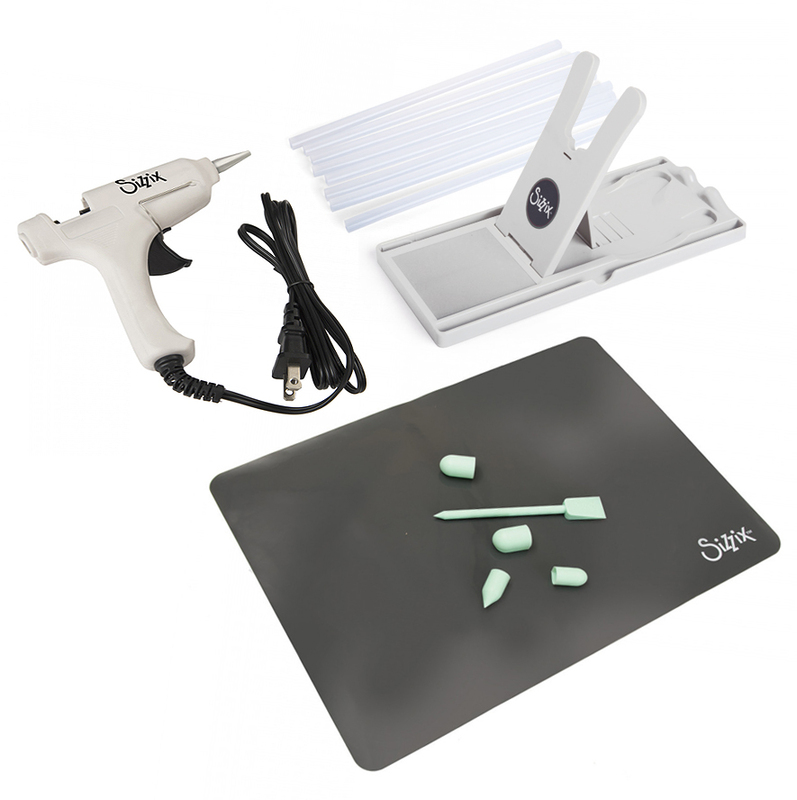 No more ruined tables, countertops, desktops, or tablecloths since the Hot Glue Gun Stand is the perfect assistant to hold your glue gun upright and catch any unintended glue drippings in a handy, wipe-away space. 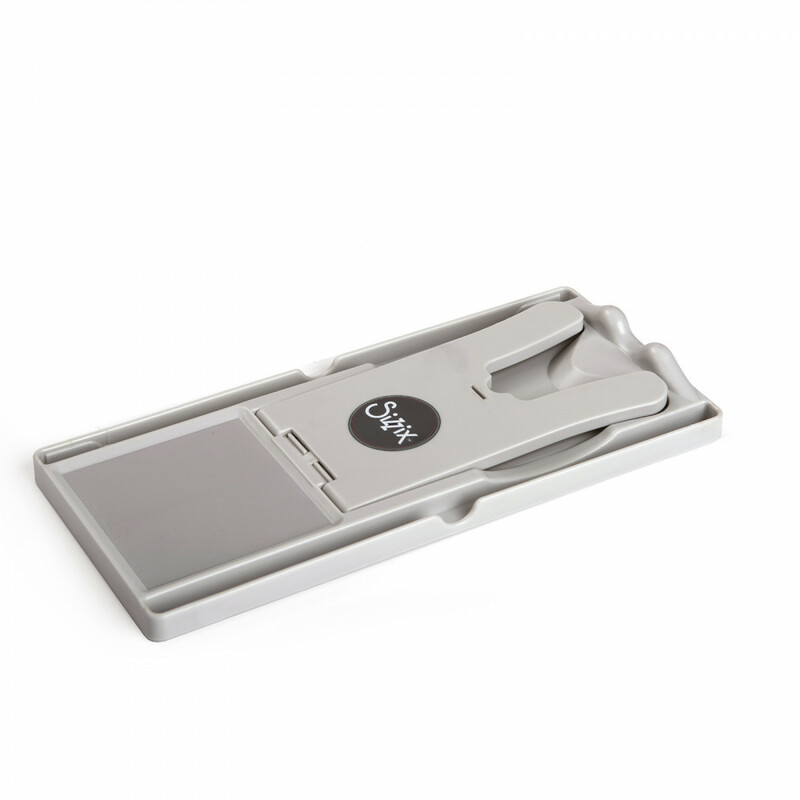 And say goodbye to those upsetting little incidents of scorching hot glue on your fingertips, palms, and knuckles as you adorn your silicone fingertip caps and utilize the versatile stylus/spatula to safely maneuver the glue wherever it needs to go. You will hardly remember the days when you didn't have this amazing bundle of tools for all your gluing needs! Always unplug your Sizzix Hot Glue Gun after you are finished with it. Allow the glue gun to fully cool before you put it away for next time. Don't try to pull the glue sticks out of the glue gun once they are inserted; feed the remainder of the glue stick through the glue gun. Follow basic safety precautions when using this electric tool - do not touch the metal nozzle or heated glue to your skin as it may cause burns. 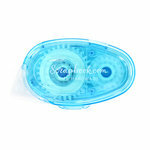 Do not use near water and avoid exposing the Sizzix Hot Glue Gun to moisture. When you've glued everything in sight, and need to glue some more, check out this 20-pack of Sizzix Glue Sticks perfect for refilling your Sizzix Hot Glue Gun! In the Sizzix video on this item, Jen Long shows an on/off switch. It is just not visible in the photo? By: amethyst48 (22-Nov-18) Helpful Question? Yes | No Thank you! Report Inappropriate This question has been reported. Thank you! This Glue Gun actually has an on/off button. I hope this helps. By: Amber Boren (23-Nov-18) Helpful Answer? Yes | No Thank you! Report Inappropriate This Answer has been reported. Thank you! Is this high temp or low temp glue gun? Can both types of temperature glue sticks be used with this glue gun? Thank you. By: pollynana247 (06-Sep-18) Helpful Question? Yes | No Thank you! Report Inappropriate This question has been reported. Thank you! This glue gun is compatible with high-temperature glue sticks. I hope this helps:) By: Amber Boren (06-Sep-18) Helpful Answer? Yes | No Thank you! Report Inappropriate This Answer has been reported. Thank you!